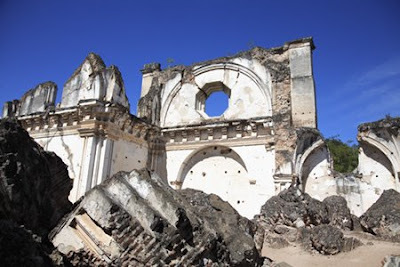 It’s hard to fathom how large the Iglesia y Convento de La Recolección must have been before an earthquake destroyed it in the 1700s little more than half a century after it was built. 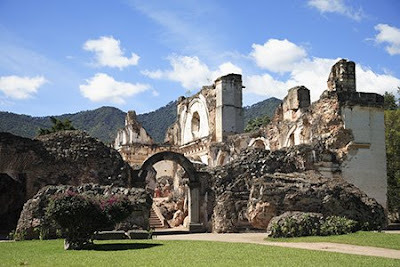 Located on the outskirts of Antigua, Guatemala it is one of many churches in Antigua to be destroyed by earthquakes. Its remains are like an architectural dinosaur in terms of scale. Perhaps its massive size made it too daunting to rebuild. Some of its peers in other parts of town have been resurrected in the aftermath of earthquakes including Catedral de Santiago and La Merced Church. The ruins, which at one time also included a convent, are located on Avenida de la Recolección about a 10-minute walk from the center of town. The catastrophic site is surrounded by serene well-manicured gardens. If you show up in the late afternoon you might even have the place to yourself. Thanks for the photos, old ruins are so evocative. Those ruins are still beautiful, despite the destruction of much of it's structure. It looks like a very peaceful place. Thanks all for stopping by as always. Rob, thanks for the stumble.